My garden is built around chickens. I depend on their help in preparing the garden site, improving fertility, and adding organic matter to the soil. Most days the chickens range free, but they always have access to a secure run that is located inside the garden and attached to their house. Filled with straw, leaves and wood mulch, this chicken scratching yard is actually a mulch factory, which the hens relentlessly scratch and peck, while adding their own inputs of manure and feathers. I encourage scratching by throwing their treats, such as sunflower seeds or corn, into the mulch material. We're often cautioned against using chicken manure in the garden because it is so high in nitrogen that it can burn plants, and because it can carry disease. But many gardeners have found, as I have, that if you use plenty of high carbon mulch and allow time for composting, chicken manure is really great for the garden. 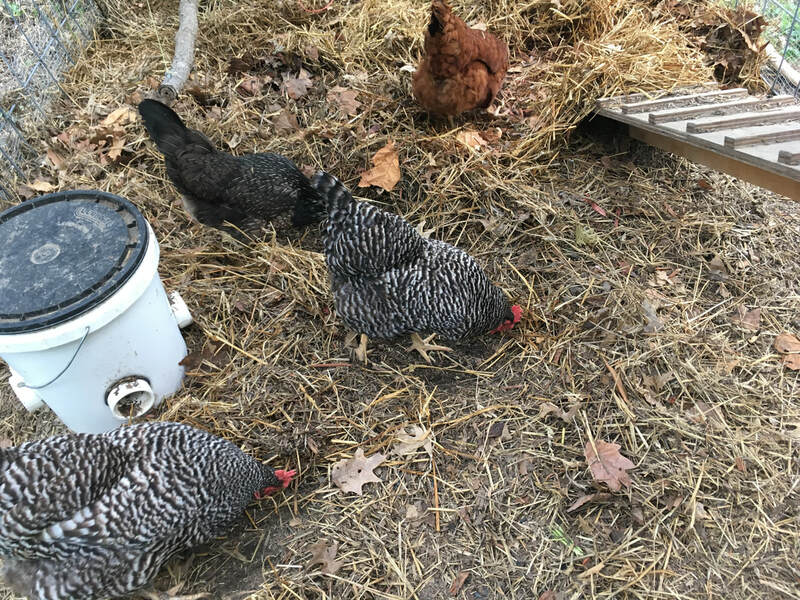 Garden Fertility Rotation ​- Actually, there are two chicken run areas attached to my chicken coop, but at any given time the chickens have access to only one. During year one, they were in the west side run, while I built the east side run. In year two the chickens moved over to the east side run and I started a garden in the west side run. (I moved the chickens in the fall so the area had several months to mellow before spring planting.) The runs are built both to protect the chickens from predators and the spring garden from rabbits and deer. So far this has been a great way to add fertility and organic matter to the garden and to keep the peas and greens safe from marauding mammals! In the image above, the hens are busily scratching and fertilizing the eastern run. In the the image below, they have been moved out, and the eastern run has been prepped for spring planting, though that won't be for at least 3 months. Water Management - ​My current garden site has clay soil, poor drainage, and a slight slope. We're in a humid continental climate, and after a heavy rain, there can be puddles and standing water for the entire next day. putty. Then I bury the clay pot and plant the water-loving plants in the soil nearby. Several plants can be clustered around a single pot so that their anticipated root zone will include the clay pot. After I fill the pot with water, I cover it. The water slowly seeps out through the unglazed clay, providing slow-release, subsurface irrigation. I use pots that hold about a quart of water and during the driest times of the year, if the plants are in full growth, I might fill up the pots as often as twice a week, and my plants are very happy. 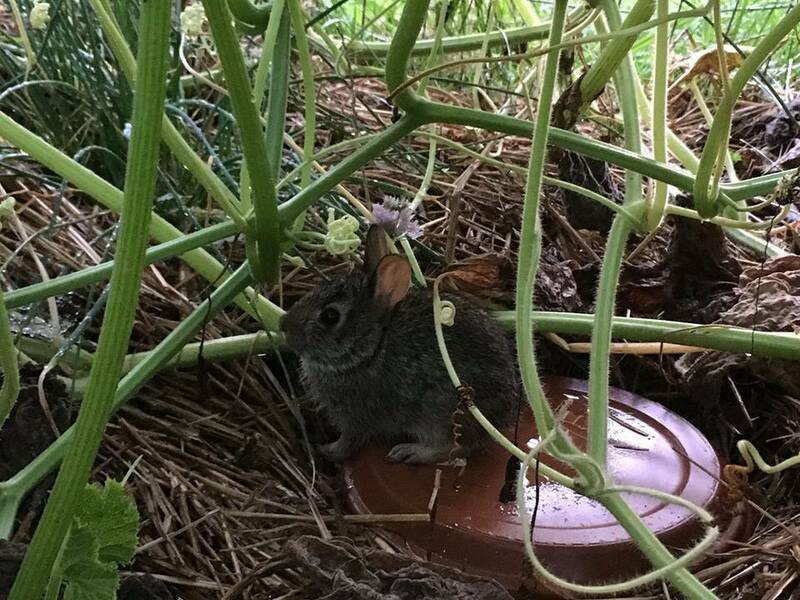 This technique is borrowed from the Indians of the American Southwest, who used clay pots or ollas to irrigate their crops.​ Combined with chicken-powered mulch, this technique has done a lot to keep my plants (and resident bunny )happy. beds run north to south. 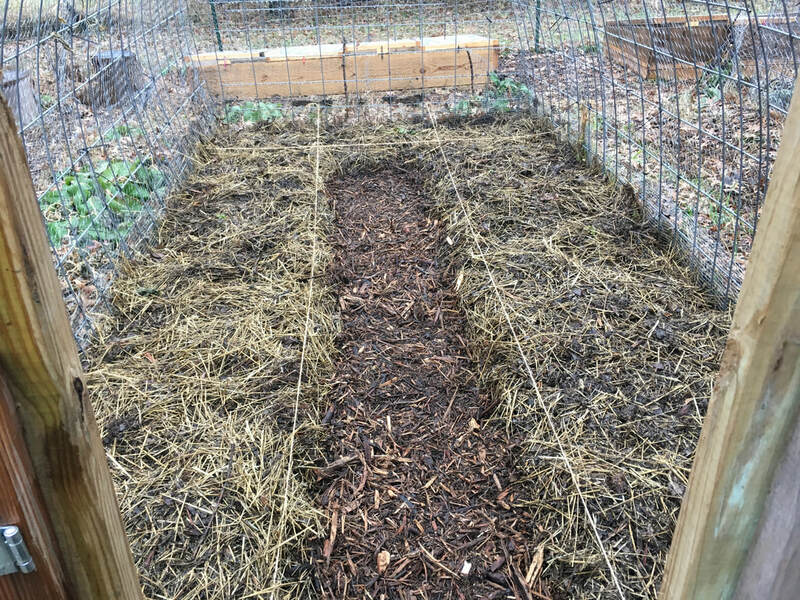 The beds are 2, 3, or 4 feet wide, so that I can easily plant according to the square foot gardening method and so that I can reach the middles of the beds without stepping on them. The exception to the north-south arrangement, is, of course, the cold frames. They have to be oriented toward the south to catch whatever winter sun they can. 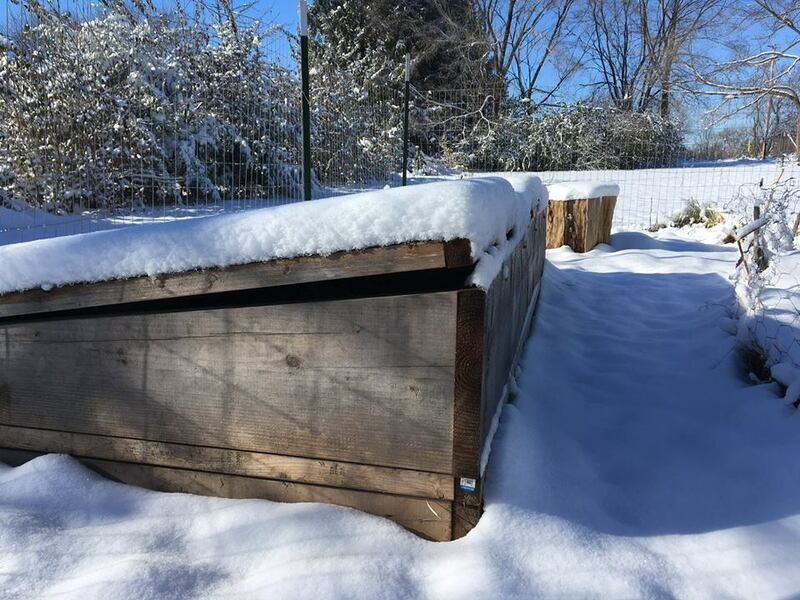 My cold frames are based on the ideas Elliot Coleman lays out in his book, Four-Season Harvest. few new varieties of vegetables, and-- well, the list goes on. If you want to see more pictures of the chicken-powered garden as it progresses, click on over to the ChickenGarden Gallery.